Everyone experiences some amount of stress in their lives, but sometimes stress can pile up or levels of stress which were once manageable can wear at you until it becomes too much. It is important to recognize that everyone responds to stress differently. 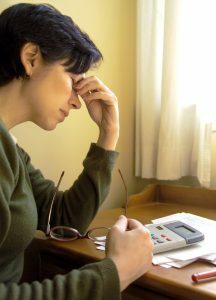 Some people feel overwhelmed and have difficulties concentrating, while others may become tearful or angry. Everyone needs to listen to their mind and their body so they can recognize when stress is becoming a concern for them. Take note if you’ve started to feel exhausted, anxious or depressed. Identify and remove the causes of stress that you can. See what can be changed at work, at home, or with the other causes of stress in your life. See if you can delegate some tasks to others, so you are not trying to do everything yourself. Relax. Try meditating, taking a one-minute time out, get a massage, etc. Also, allow yourself time for your hobbies or for fun activities that will allow you to take your mind off of your problems. Get active. Exercise and sports can be an excellent release for people. Control your time. You might not be able to do everything you want to achieve at work, at home, at school, etc. Take time to prioritize what needs to get done so that you can decide what you can and what you cannot manage. Get enough rest. Make sure you’re allowing yourself time for sleep. If you are having troubles falling asleep or are experiencing disrupted sleep, speak to your health care professional. Share with others. Talking with loved ones and friends can be an excellent release. You do not have to deal with everything on your own, people want to help, just ask. Most importantly, if you ever hit a point where you simply can no longer deal with the stress in your life, ask for help! See your physician or mental health professional if you feel stress is becoming too difficult for you to manage.